It's kind of like one of those dancing and singing motion-sensor skeletons that are popular at Halloween - but it's scary and loud and actually works! Scarecrows are designed to fend off larger pests like rodents, birds, deer, and, in Japan, wild boar, and they actually do work – at least for a bit. Animals are clever and will eventually realize there’s no harm once they notice it never actually moves, let alone attacks. There are plenty of more modern devices on the market that seek to address the same problem, from sonic methods to 3D-printed falcons to strips of reflective tape, but there’s nothing quite like the Super Monster Wolf. The Super Monster Wolf – this is a Google translation from an Asahi article, so we might be missing some nuance – is a stationary wolf-shaped (sort of) robot-creature-thing with a sensor that triggers sound and motion whenever it detects an animal in the area. It produces extremely loud roaring and howling sounds, and the head, which is outfitted with glowing red nightmare eyes, swivels back and forth. It looks, and operates, suspiciously like one of those plastic Halloween skeletons that plays “Monster Mash” and dances when someone walks by. Amazingly, this device seems to work. An agricultural cooperative near Kisarazu, a small city in east-central Japan, has been conducting a trial in local farmlands, where wild boars are a big problem and they’re reporting a noticeable downturn in damage from the pests. Wolves, which are extinct in the area, are the boar’s natural enemy – a fact that the manufacturer is counting on to keep the pigs sacred of the Super Monster Wolf. The Super Wolf Monster goes into production next month and will retail for nearly $5,000 each, though farmers will be able to lease it as well. 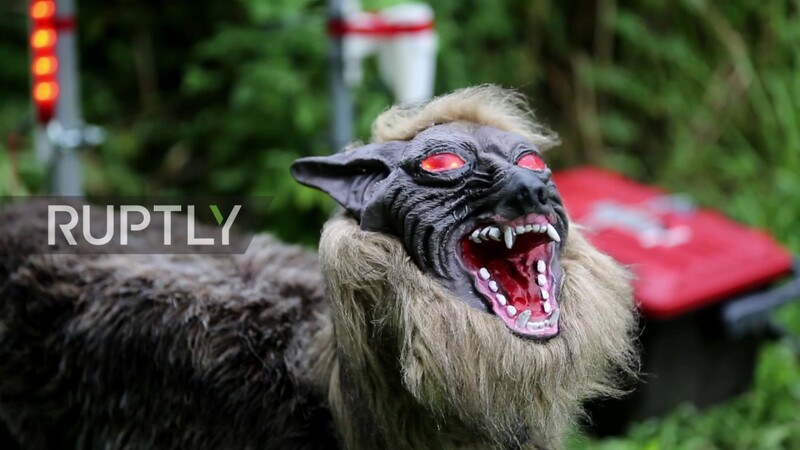 No word yet on whether the robot wolf scarecrow will be available in the U.S. In the meantime, allow us to recommend this inflatable fellow.